The A2B Route left Buck and Doe Road to pass by and run around the Grand Canyon Skywalk. 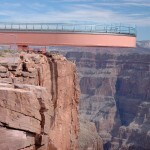 The Skywalk is horseshoe-shaped cantilever bridge that extends out over the edge of the Grand Canyon. The vertical drop directly under the skywalk ranges between 500 ft. and 800 ft. To heighten the experience of walking around the bridge’s loop, the floor was laid with thick transparent glass. A little unnerving for some. Thrilling for others!! After leaving the Skywalk, I turned southward back to Buck and Doe Road running along the east side of the Grand Canyon West Airport’s runway. Imminent rain in the forecast meant an early rise and run. It was still a little dark as I rolled out of bed. Stretching was mixed with heavy yawning. Since I had planned a long run, I went to grab some Sports Beans to give me a little boost or two throughout the run. However, I was all out. So I grabbed a bottle of Gatorade instead. I decided while stretching to not follow any particular route, but rather run for time. I decided in what direction to go and off I went. I found a park where a spring festival was being held. Vendors, who had arrived early, were setting up their booths and putting out their wares. Early walkers were already perusing. It was a nice scene. The air seemed full of sunrise and laughter. After about 40 minutes, I looped around and began meandering back towards home. On the way, I found myself running alongside a BUNCH of other runners on a race course for a 5K run for the March of Dimes. Some of the runners were dressed for fun! One guy was wearing coats and tails with his running shorts. One group of ladies sported some very pizzazz-y sets of beads, glasses, and hats. As for me, I had fun waving and high-fiving people cheering along the route. After about a mile, the race course turned a different direction heading to its finish line while I continued towards mine. Kind of a fun running adventure! Plus I beat the rain!! As I ran this morning, my thoughts wandered over the past 14 years. On April 28, 1999, my youngest son, Rayne, was born. How absolutely incomplete our family would be without him! An entertainer by nature, he has be the source of countless smiles and laughter! His quick wit and sometimes accidental humor have kept his brother and sisters in stitches for years! Growing up with 3 older siblings, he always assumed their friends were his friends too. He was always comfortable in any crowd, it seemed like. Now at 14, he has his own direction and set of friends. Early on, he discovered a love for theater and the aspects of theatrical productions. He seems to enjoy everything from being behind the spotlight to being on stage. As he continues through these roller coaster years of high school, I hope that he finds the strength that his Mom and I have always known and seen in him. He is a good, good young man! I am proud of him! I am so happy to be Rayne’s Dad! Today, I, too, have thought back to Rayne’s birth then played forward the fourteen years. He had to be the happiest child and one of the most loved on the planet! He smiled early and had a constant smile on his face. His brother and two sisters adored him! I can remember that next Christmas all the family got together. Caroline Hope who is just a week younger than Rayne was unhappy unless Angela was close by but Rayne charmed her with his smiles and happy nature! Everybody young and old loves Rayne!! He is a delightful young man and his Papa and I love him more that words can tell. He has blessed our lives! He is a marvelous grandson. Happy Birthday, William Rayne O’Bryant and many more!!! !